Construction sites are busy enough by themselves. But when you factor in the endless flow of vehicular and pedestrian traffic, these areas can become unduly brutal for a traffic management company. Roadway Construction Service (RCS) knows these work zone challenges very well. And we know of only one way to meet them – with the industry’s most effective work zone traffic control strategies. If there’s a road construction project to tackle, Roadway Construction Service will have a workable solution. Ours is no haphazard traffic control company. We consider all variables and contingencies before committing to a course of action. One of our prime considerations is the public right of way. Frequently, construction activity impacts right-of-way areas, such as a sidewalks or roadways. Congestion easily can develop among motorists, pedestrians, and workers. To maximize public safety and orderly traffic flow, strict municipal codes govern these travel routes. 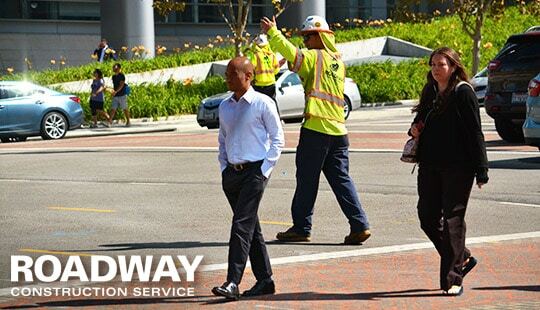 Roadway Construction Service knows the codes inside and out. In fact, they guide us every step of the way. This knowledge gives us a distinct advantage when implementing traffic control strategies in public right of way areas. Controlling public right of way often requires the closure of one or more lanes in the project zone. This step is necessary to ensure the effective maintenance of traffic. Closing roads eliminates the possibility of hazardous interference from passing vehicles. The potential hazards, of course, apply to both motorists and work crews – the two generally don’t mix and must be safely separated. Hence, road closure often is a key component of temporary traffic maintenance services. Shutting down roadways, however, is not simply a matter of dropping road barriers into place and hoping motorists get the message. The process must begin well in advance, typically with a road closure request. Such a request is submitted to the government agency designated to grant such authorizations. Knowing the territory, including all applicable codes, comes in mighty handy at this stage. Fortunately, Roadway Construction Service is thoroughly familiar with all the ins and outs of the process. As previously mentioned, we know the codes associated with processes such as road closure. This knowledge gives us a major edge when submitting road closure request forms. All the t’s are crossed and all the i’s dotted when the paperwork reaches city officials. Code compliance is something that’s virtually assured. Equally important is our almost communal connection with decision makers. They know us well, and vice versa. That should come as no surprise. We’ve dealt with these individuals for many years. We know what they want and expect. In fact, a kind of synergy exists between the two sides. Consequently, we’re consistently able to satisfy their expectations. This is a welcome byproduct of our long-standing and highly-productive relationships. Encroachment permits are one of the authorizations we must secure when a road is closed. Essentially, these permits allow a work project to intrude temporarily on public right-of-way-areas. Our knowledge and relationships enable us to secure these authorizations with minimum hassle and maximum speed. For this reason, Roadway Construction Service is unbeatable when it comes to obtaining temporary encroachment permits in California. Roadway Construction Service divides work zone traffic control into two basic components. The first of these is hardware. No, we’re not showing up with roaring machines. For our temporary traffic control, hardware typically takes the form of traffic barriers. Generally utilized during lane closures, traffic barriers come in a variety of shapes and sizes, from K-rail to traffic cones. 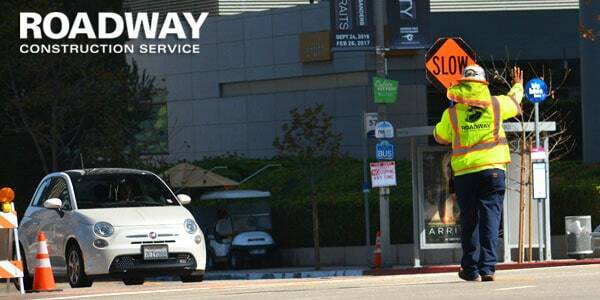 Traffic guards such as these are crucial for the protection of motorists, pedestrians, and work crews. For this reason, we focus abundant attention on the deployment of Road barriers. They don’t move much; but they do work hard. Why does this make a difference when implementing a temporary traffic control plan? Well, two types of k-rail are available to road crews. One, the concrete k-rail is forbiddingly heavy – a big, solid concrete barrier. Because of its bulk, the concrete barrier is intended solely for long-term projects. The reason for this is obvious – lifting and placing a mass of concrete requires costly labor, equipment, and time. Plastic Jersey barrier, on the other hand, is ideal for short-term work projects. As its name implies, this type of barricade is made of a strong yet relatively lightweight plastic shell. Inside are hollow water chambers. Designed to be portable, the plastic k-rail is moved into position with comparative ease. Once in place, its inner chambers are filled with water, creating a strong, solid interior. Movement, however, certainly is evident in our second component – the traffic control crew. Every traffic controller on our team is a master of motion. Rest is not an option. Each flagman must flip, shift, turn, and wave the signal flag in an ongoing communication with spotters (traffic observers), motorists, and pedestrians. No traffic flaggers on our squad could ever be accused of idleness. Nor could they ever be labeled unqualified. That’s because their education is second to none. Each of our flaggers has been ATSSA-certified, proof positive they’ve been trained to the highest safety standards. ATSSA (American Traffic Safety Services Association) is the ultimate boot camp, providing intensive, work zone training courses that expose students to real-world situations. Upon “graduation,” ATSSA-certified flaggers can climb mountains if they have to. Would you like to learn how our work zone traffic control services can improve the safety and efficiency of your construction project? 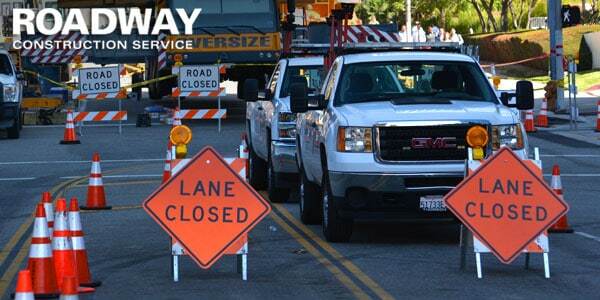 Reach out to Roadway Construction Service for more information about our industry-leading solutions and competitive rates.